If you have been looking for a crate for your pup, you will have noticed one thing – they can be a bit of an eyesore. At the very least, you can be quite sure that they are going to stand out if you are planning on keeping them in your living room. Fortunately, there is a solution to this problem: dog crate end tables. While these function as dog crates, they also look like end tables, ensuring that they fit in well with the rest of your furniture. Of course, picking out good quality and aesthetically pleasing crate end tables aren’t that easy. So, if you need some help with this, then this is the guide for you. 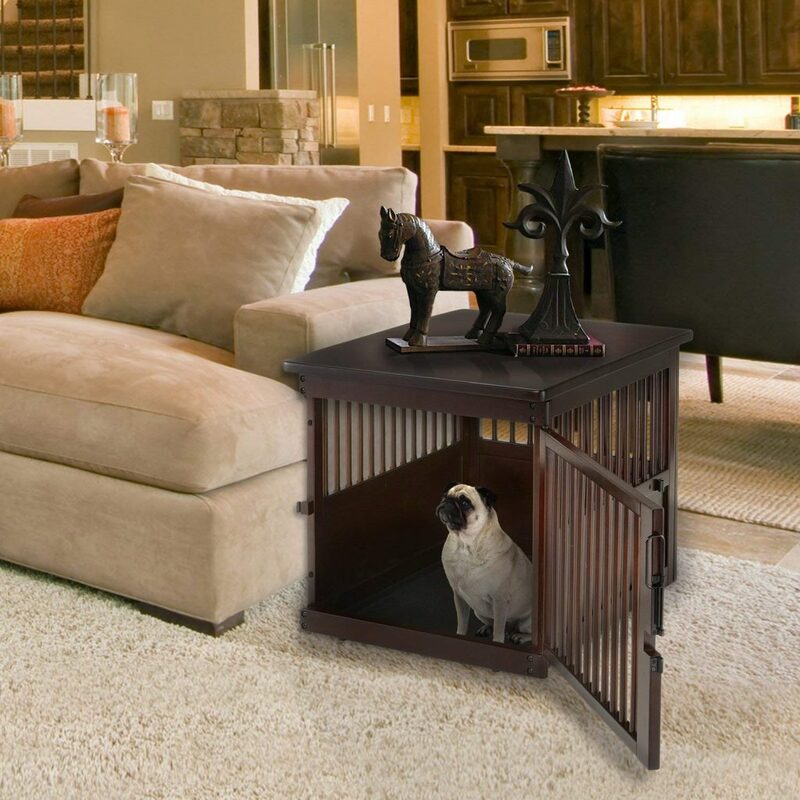 With the following guidelines and list of top products, you will have no problem finding the best dog crate end table for your pooch and your home. The most important feature of any dog crate end table is that it is a suitable size for your pooch. This is something you need to pay special attention to when buying this type of dog crates. See, there are some manufacturers who focus more on design rather than comfort and so, can build too-small crates. 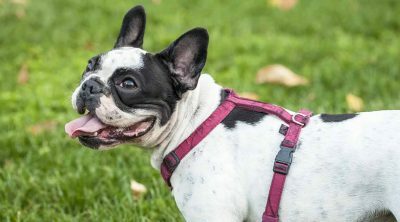 Well, even if you are only keeping your pooch in a crate for a short period of time, you need to make certain that is just the right size for him or her. 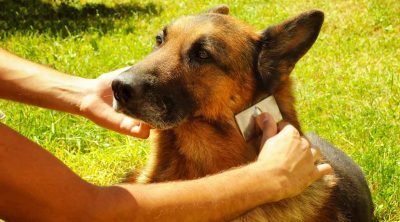 In short, your dog should be able to sit up, lie down, and turn around without any problem at all. Rather than buying crates based on guesswork, make it a point to measure your pooch in all of the positions mentioned above. Then, compare these to the crate end tables available on the market. Check that the crate dimensions are a lot greater than those of your pup. 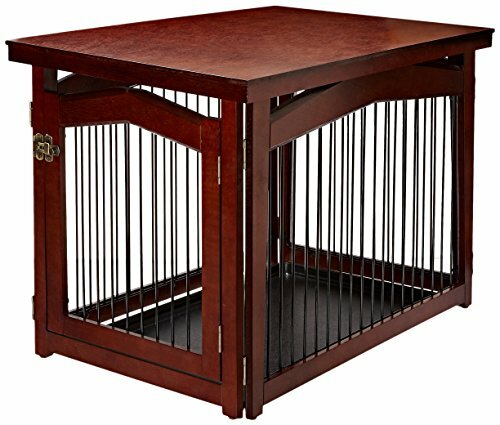 The best way to keep your dog as comfortable as possible in a dog crate end table is to make certain that the area is properly ventilated. Basically, the more air that can flow through the cage, the better. This is why you should always look for either widely spaced wooden slats or widely spaced bars or mesh. You also need to be certain that these ventilation features are at eye level for your pooch. Not only will this keep him or her a great deal cooler, but it will also make certain that they don’t feel claustrophobic. The thing about dog crates that also double as end tables is that most of them – if not all of them – are largely made up of wood. This, of course, is so that it matches the rest of your furniture. The only concern with this material is regarding durability. As you can imagine, wood isn’t nearly as strong as metal. So, if you do have a pup that likes to chew or destroy, you are going to have to look around for a crate end table that is made from sturdy wood. It should be more than capable of withstanding a little use and abuse. Not to mention, check that the rest of the features holding the crate together are of a similar caliber. On a similar note, a good dog crate end table will need to be secure and capable of containing your pooch for a period of time. This is why you will need to carefully examine the latch that is placed on each of the doors. 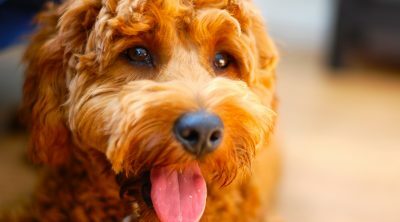 One thing to ensure is that your pooch can’t reach the latch to undo it by him or herself. The latch should also be strong and steady enough to stay in place, even if your pooch rams the door a few times. Another thing that you should be aware of is the fact that these dog crate end tables can come in a wide variety of designs and colors. 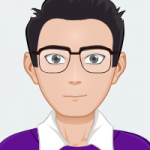 So, you may have your work cut out for you here. For one thing, you need to make sure that this item looks good and actually pass for a high quality end table. Then there is also the fact that the end table needs to match your surrounding furniture as well. This is where the type of material, grain, and the color comes in. Make sure to examine each element of the crate end table carefully and check that it matches what you already have in your home. Considering that most of these items are made from neutral materials and shades, you should be able to find a suitable fit. The thing about dog crates (even ones that function as an end table) is that they need to be cleaned regularly. Therefore, it makes sense to pick a crate that can be wiped down or cleaned with minimal hassle. When searching for end tables, look for various features that can make your job a little easier. This includes removable pans, materials that don’t stain, and similar elements. So, when it does come time to clean out your pup’s crate, you will find that there is a lot less effort involved as a result. One of the main advantages of this wooden pet crate is that it is available in a variety of colors. You can get it in black, espresso, taupe gray, and white. Therefore, there is a good chance that you will be able to find something that is a perfect match for your own furniture. The crate is also available in different sizes. There are crates that are suitable for small, medium-sized, and even large dogs. Best of all, the crate that is meant for larger dogs has been specifically designed for bigger pups. As such, they will be able to comfortably fit in there without any issue at all. There is also plenty of ventilation for your pooch thanks to the multitude of slats on all four sides of the crate. So, there will be plenty of airflow to keep them comfortable. To add to this, the crate is also made from solid wood that is capable of standing up to even the most rambunctious pup. The latch also works quite well to keep your pup inside while also being rather simple for you to work. The minor caveat with this crate is that the top of it isn’t completely scratchproof so you will need to be careful about the items that you place on top of it. 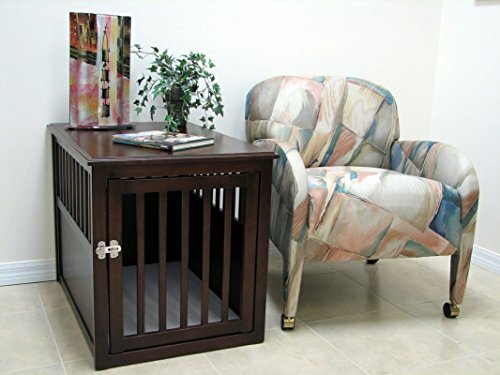 Now, this pet crate end table may not have as many color options but it is certainly quite beautiful. Available in espresso and mahogany, this is an excellent addition for a living room that boasts furniture of a similar hue. The design is also classic which makes it even more versatile. The crate end table has two size options – medium and large. What’s great about both of these is that they are incredibly roomy. So, regardless of the breed or the size of your pup, you will have no trouble getting them to fit in. What’s more, they will have plenty of space to move around as well. Another feature to approve of is the fact that this crate end table is incredibly tough and sturdy. It is composed of durable hardwood. So, even the most hyper pup will not be able to put a dent in it. What’s more, the latch is also quite secure and is great at keeping the door tightly locked. The only issue is the door which swings inwards, making it a bit tricky to get your pooch out of the crate. There is also the fact that the floor of the crate is made from waterproof melamine. So, not only will the base not absorb any water but it will also be an absolute breeze to clean up should any “accidents” occur. If you want to keep your pooch as comfortable or as calm as possible, then this will certainly be a good crate end table to choose. This is because it has lots of space for air to flow through. 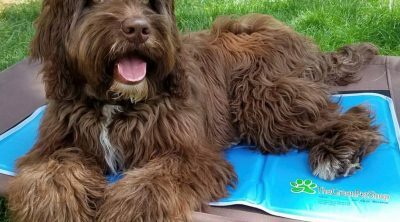 Not only does this boost ventilation but it also allows your pup to see out without any issue and feel at ease. Despite this design, you can be quite certain that this is a strong and well-made crate. The frame is made from solid wood veneer while the bars are made durable metal. Due to this, you can be quite sure that it will last you for a long time. That being said, it should be noted that this latch isn’t too secure. As such, this crate is best for pups that are used to crates and won’t try to escape. The crate is available in just one color – brown. However, it has beautifully constructed and a great deal of effort has been made regarding detail. As such, this will be suitable for virtually any living room where this shade is a good match. The crate comes in both a medium and a large size. 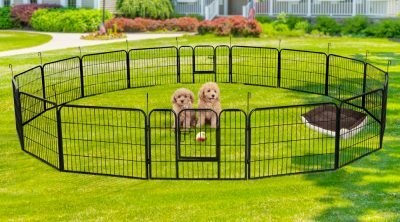 These boast generous dimensions and are great for pups of all breeds, sizes, and ages. The crate is also equipped with a plastic tray at the bottom that can be removed and cleaned without any hassle at all. Whether you have a modern or a classic home interior, you can be quite sure that this crate end table will fit it perfectly. This is largely because of the gorgeous design that allows it to really look like a part of the furniture. Since the end table comes in two neutral shades – black and white, it is also quite versatile to boot. It should be noted that this crate end table is meant for small to medium sized dogs. There is only one size available and it isn’t suitable for larger breeds. However, as long as the dimensions are compatible with your pup, you will find that they are quite comfortable inside of here. As an added bonus, there is also plenty of ventilation thanks to the thin, metal bars. Furthermore, your pup can peer out whenever he or she wants to, ensuring that she is always a part of things. The door can be opened a multitude of ways, making it even easier to get your pup in and out of the crate. Made from medium-density fiberboard, the crate also does a good job of holding up. The bars are metal and are also incredibly durable. Unfortunately, the bottom of the crate is also made from this material. As a result, this can make it rather tricky to keep clean. This is yet another crate end table that will work well in a multitude of living rooms. Despite there being only one color, the crate/table comes in a deep brown that is suitable for different color schemes. So, if this shade is similar to what you already have at home, you can be certain that this will be a good fit for you. This item also functions rather well as a crate as well. For one thing, it is solidly built made from beautiful and strong wood that works well to hold dogs of all natures. There are slats all around the crate that ensure your pooch has top-notch ventilation. They are also treated to a great view as well. The crate is available in three sizes – small, medium, and large. Due to this, you will be able to find a suitable fit for your pup regardless of their size, breed, or age. 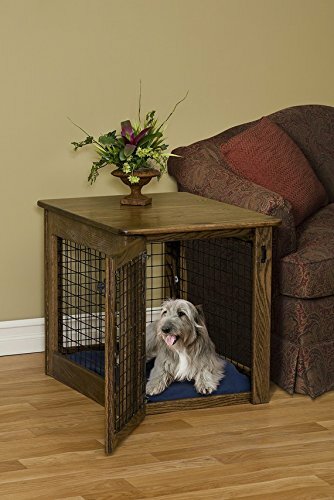 There is plenty of room afforded with each of these crate sizes and your pup will definitely be comfortable. The latch is well-made and placed too, ensuring that your pup will not be able to get out by him or herself. The biggest complaint with this crate end table is the bottom of the crate consists of an ill-fitting plastic tray. 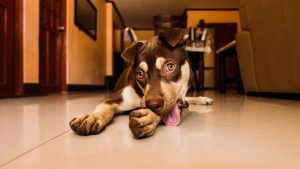 So, if you don’t want your pooch’s mess to get on your floor, you will need to take certain precautions. 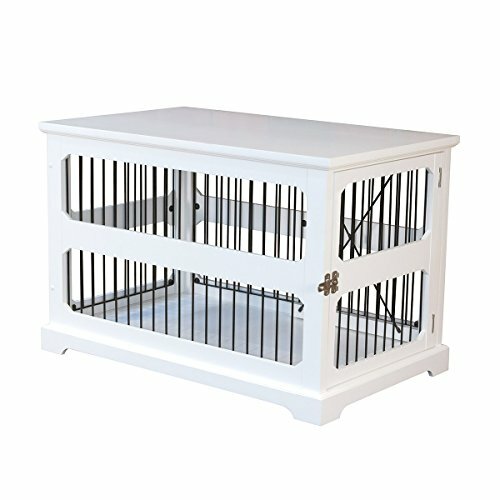 If you are picky about how your dog crate end table looks, then this is a good manufacturer to go with. You will find that there are so many different shades to choose from and each of the stains is gorgeous. So, if high quality and detail are your main priority, then this table will work well for you. That being said, it should be noted that this dog crate end table is largely meant for smaller pups. The dimensions are just enough for smaller breeds or small puppies. It is unlikely that larger dogs will fit in here. Nevertheless, your small dog should have plenty of space to move around. Another good feature of this crate end table is the fact that there is a lot of ventilation since it relies on a crisscross pattern. Since this design is on all four sides of the crate, your pooch will be able to easily peer out as well. They will not feel isolated at all. Now, this crate is made from authentic oak wood which is why it is so stunning. At the same time, this wood is incredibly durable to boot. Therefore, it is unlikely that your pup will be able to gnaw through it. 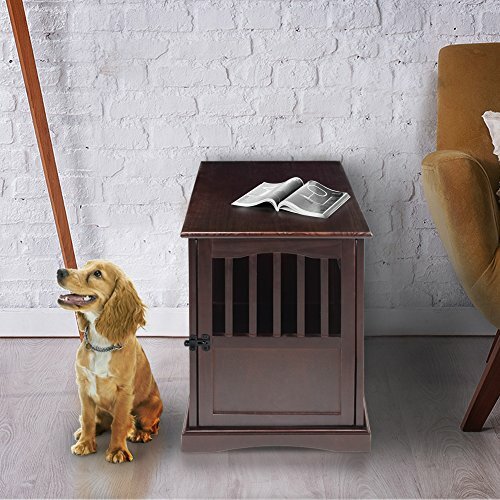 If there had to be just one winner picked out from this list of top-notch items, then it would have to be the Crown Pet Products dog crate end table. 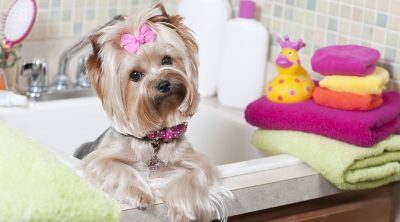 It is incredibly spacious making it suitable for virtually any pooch. It is also well-built and designed, making it a good choice for both you and your pooch. Last but certainly not least, it looks great and is a good match for most living rooms. 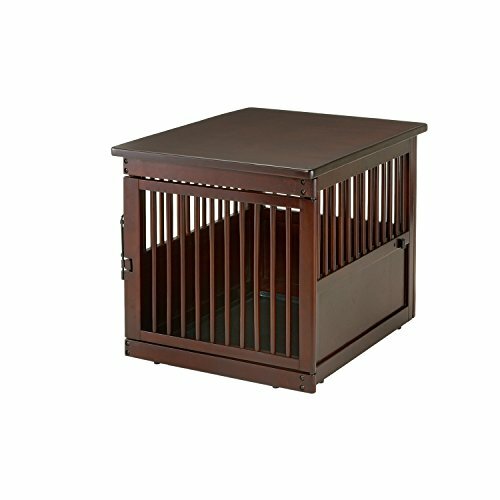 If you are looking for the best dog crate end table, this guide should be all the help that you need. By the end of this, you will be a total pro at picking out this item and will know exactly what to get. Do wolf dogs make good pets?